Editorials from Theslowlane: Suspicious Of Urban Villages? 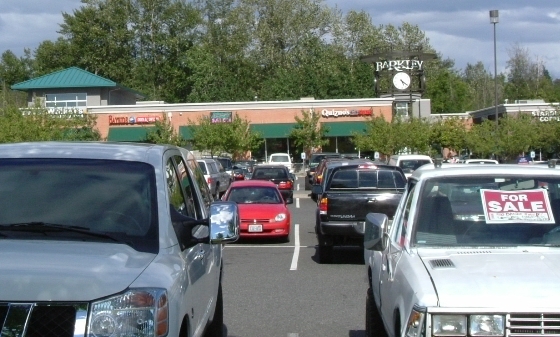 Somewhere behind all the parked cars is Barkley Village in Bellingham, WA. I still like it better than most retail developments because a bike trail goes past there. Retail developers usually say, "we must provide parking to be viable." See if you can spot the "village" across that vast parking lot. See the "for sale" sign? No, that's not it. European villages have charm, so they say, but I must admit, I have never been outside USA and Canada. Now, a lot of urban planners, in America, are talking "villages," but some folks are wary. This skepticism has appeared in a few reader comments to some of my blog entries. Especially a recent entry related to Chuckanut Ridge, development proposed on Bellingham's south side. Maybe, most American developers can't be trusted to build true villages. I once saw an article, in a Seattle paper, that discussed Barkley Village and a few other developments in the Puget Sound area. They were seen as examples of "new urbanism." A great innovation, or is it just placing brick facade on the supermarket to make things look "quality?" Basically just the same old story? A glorified strip mall? One difference between Barkley and the proposed development at Chuckanut Ridge is Barkley's retail focus. Chuckanut proposes "mixed use" with residential as the primary focus; from what I can gather. That may, or may not, make much difference, but retailing does tend to "bring on the parking lots." With automobiles, population growth and the profit motive so engrained in American society, maybe we can't create villages in a positive way. We might be stuck with "lesser evil" compromises. Some would say that Bellis Fair Shopping Center is an urban village. It's pedestrian friendly inside the mall. One can walk from one end to the other with out having to cross streets or be in the rain. On the other hand, try walking TO Bellis Fair. Pedestrian connection to everything else is treacherous. Also, people would say that any village owned by one private entity is not a village. Try passing out leaflets in the village, or doing anything besides "shop till you drop." Private owners tend to "control" public life on their properties. Many so called urban villages are owned by single proprietors. That means the "village space" doesn't really exist for public use. Therefore, the question of how we connect these developments is very important. How are these developments connected to one another? Barkley Village does, at least, have the bike / pedestrian trail going past. Maybe that's not much, but it's something. Connectivity between various developments. That is an important question. The "village square" is usually a pedestrian place that is publicly owned. Barkley Village is a Disneyesque caricature of New Urbanism. They have a quaint faux Main Street on the east side, but the only pedestrian traffic I've seen there is between the stores and the parked cars. Follow the sidewalk on Woburn and you find it ends at the automobile entrance, you have to dodge cars across the asphalt to get to a store. Yes, a nice bike trail runs behind it, but if you try to reach the neighborhood to the east by sidewalk, you're S.O.L., because it dead ends after 200 feet, leaving you to scramble through the bushes if you want to reach the "neighborhood" of cul-de-sacs. The principals of New Urbanism, walkability, connectivity, mixed use, community spaces, all are missing from this P.R. sham. It is, however, a nice place to sit at the tables outside Starbucks while looking at - yes, you guessed it - another Starbucks. This area still has potential as an urban village, with large tracts of undeveloped land that could truely become an urban village if the community, not developers, set the design criteria.